As you may know, I’ve been drinking quite a few chocolate shakes lately. So much so that I’ve been going through my ingredients fast! This shake is the happy result of me running out of my usual ingredients. On the weekend I’ll usually make a double-batch of smoothie for Austin and I to share, but I didn’t have enough ingredients to make a big batch of my usual recipe– so I decided to replace them with a few spoonfuls of peanut butter to help with the “creamy” factor. Holy cow, was it delicious! What sets this shake apart from my other popular Chocolate Peanut Butter Banana Shake is that it’s sweetened with dates, instead of banana. Don’t get me wrong, I do love bananas in smoothies, but sometimes I don’t want the “banana flavor” that comes along with them. Dates add sweetness without a distracting flavor, making this shake taste downright decadent– remarkably like a liquid peanut butter cup! And, just in case you don’t already love dates as much as I do, studies have shown that dates can be considered a low-glycemic food and that they may even be beneficial for those dealing with diabetes. So, I hope everyone will enjoy this delectable shake as much as I do! *Peanuts are one of the crops most heavily sprayed with pesticides, so make sure to buy organic whenever possible. Combine all of the ingredients, except for the ice, in a high-speed blender and blend until the seeds are completely broken down. Add in the ice and blend again to create a thicker shake that’s cold and creamy. Serve immediately. Note: If you don’t have a high-speed blender, I’d recommend soaking the chia seeds and dates in the water at least 20 minutes ahead of time, or even overnight, to help them break down in the blender easier. 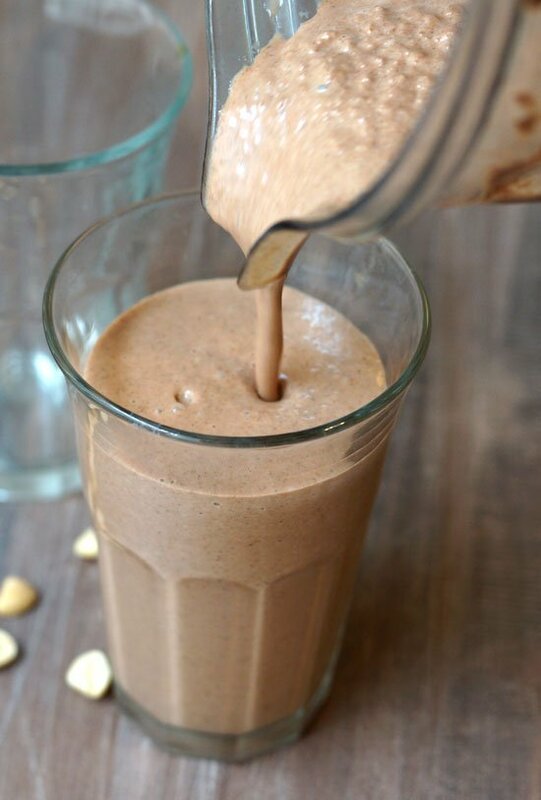 A creamy dairy-free milkshake that tastes like a chocolate peanut butter cup! Combine all of the ingredients, except for the ice, in a high-speed blender and blend until the seeds are completely broken down. Add in the ice and blend again to create a thicker shake that's cold and creamy. Serve immediately. If you don't have a high-speed blender, I'd recommend soaking the chia seeds and dates in the water at least 20 minutes ahead of time, or even overnight, to help them break down in the blender easier. 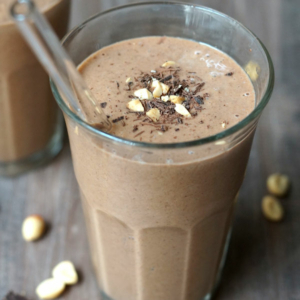 If you don’t want to use dates, I’d suggest trying my Chocolate Peanut Butter Banana Shake instead. It’s very ice-cream-like, it just doesn’t taste quite as much like a peanut butter cup as this one does. Reader Feedback: What’s your favorite shake recipe? I just made this to hopefully keep myself out of my son’s halloween candy 😂. Didn’t have chia so substituted hemp hearts also used Peanut YumButter and added a cup of spinach. Sooooo delicious and will hopefully help with my chocolate cravings. This is so ridiculously good! I make it with unsweetened almond milk which makes it even creamier! Chocolate and peanut butter heaven!! I discovered your blog 3/4 of the way through my pregnancy and had this shake almost daily. I cannot believe how good and creamy it is without any type of milk. Everyone I make it for can’t believe it, either! Not that I’m opposed to milk or dairy in any shape or form, but it’s nice to know there are decadent shakes that don’t use them! I am a Peanut Butter nut head! One bottle don’t last long for me to try any recipes but this smoothie I will resist inhaling the PB & try! Tis was amazing literally licking the glass. Subbed almond milk for water and Almond Butter but so so good! Thank you for this recipe! Made it a few times now and we love it!!! Made this for dinner last night, I thought I’d died and gone to heaven. It was insanely delicious. Thank you so much Megan! So happy I found your recipe; this is definite a go-to whenever I need that quick “fix”…smooth, delicious and very satisfying!! A few Brazil nuts makes it extra creamy :). I made this today and it was delicious! I don’t think any of your smoothie recipes have let me down! I love your website. You’ve supplied me with tons of food ideas not only for me but also for my toddler! I have to admit, I was a little apprehensive about this really tasting like a peanut butter cup. I was wrong!! It was very good and I will definitely be making it again. Thanks! This looks amazing except I need to figure out what to use in place of dates as I hate them. This is one of the best smoothies i have ever tried. But I used PB2 instead of peanut butter and it was delish! FYI: If you replace the peanut butter with 1/4 cup hazelnuts, you get a Nutella shake. Delicious either way! one word for this: DIVINE! Thank you! Very good and not Too sweet. I had been looking for something to use some raw cacao powder I purchased a while back and it worked great! Thanks, glad I found the recipe and site! Could I use almond butter instead of peanut butter? Of course! It won’t taste like a peanut butter cup anymore, but it will still taste like a creamy chocolate shake. Well now you have me totally confused. I bought the book amd saw no peanuts. What category can they be combined with? Peanuts are a legume, but to make things simpler you could just consider them to be in the “nut” category, too. This has been a BIG life savor when I am craving chocolate at that oh so special time of the month. Thanks for sharing! I just had this for lunch and it is delicious! I can’t believe how decadent it tasted! How many servings are in this shake? It serves 1 if you’re having it as a meal replacement, but 2 if you just want to share it for dessert! I drink this shake for breakfast and don’t feel hungry for 4-5 hours. Finally, found something that holds me over till lunch time. I have tried vegetable smoothies and protein shakes but they only hold me for about 2-3 hours. Thanks for sharing your life and recipes! Has this for dinner – it was really good! This is delicious! I was getting bored with my usual fruit smoothies in the morning. I’ll definitely be adding this into the lineup. Wow, so tasty! Thank you! Could I please know if you have milled chia,how much would I use? I also have vanilla powder rather than extract ,would I use more or less from your recipe? THIS. Wow. 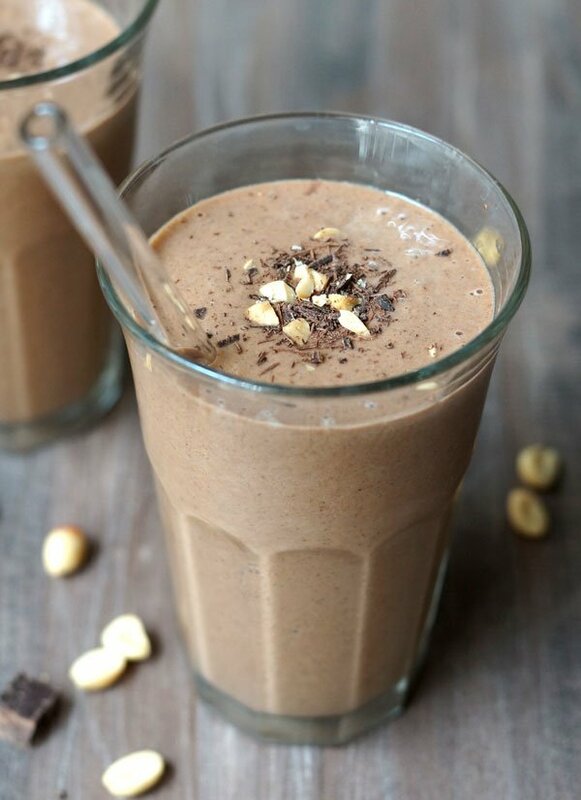 A wonderful variation to your chocolate superfood shake! It is delicious and feel much lighter than the banana version that I like too! This shake is awesome! It may even be better than the banana version. Good job, Megan! what are the nutriental value for your shakes? Well, I tend to drink a lot of protein shakes, chocolate whey shakes or whatever. They make a great meal placement, are filling and I can take them in the car to go. I love chocolate and peanut butter! It’s the best combo ever. I thought dates weren’t all that great for you because they have a lot of sugar. I have huge sugar fluctuations so I’m always on the lookout for low-glycemic foods, I will be adding these to the list…thanks!! I love some of your recipes! But as a diabetic managing the disease solely with diet, I have to correct you about dates. Dates are NOT low-glycemic (at 42 on the glycemic scale makes them medium-glycemic). They also have a high glycemic LOAD, which is what really determines the affect a food has on the body. The glycemic load of dates is staggering 18! To put this into perspective, a non-diet orange soda has a glycemic index of 67 but a glycemic load of 23. The body does not differentiate between the sugar in a soda and the sugar in a date…it cares not that one is processed sugar and the other is “natural” sugar. They both affect blood sugar exactly the same. For detoxing purposes, dates are a nice alternative to processed sugars and chemical sugar substitutes but if it’s best advised for diabetics to avoid dates. I was merely stating what research says– I linked to two different studies about it above.